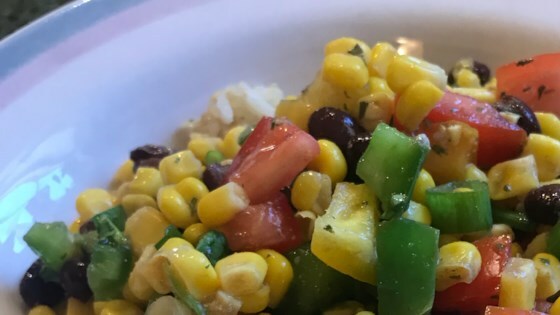 "This salad is a kaleidoscope of color and taste - black beans, yellow corn, green peppers, and red, red tomatoes. Lime juice, garlic and jalapeno give it some punch. It can also be used as a dip with tortilla chips." In a large bowl, combine the black beans, corn, green onions, jalapeno peppers, bell pepper, avocado, pimentos, tomatoes, cilantro, lime juice, and Italian dressing. Season with garlic salt. Toss, and chill until serving. I made this for a Mexican theme part and received many compliments. Great recipe! Instead of fresh tomatoes I bought canned diced tomatoes and drained them before adding them to the salad. You can't tell the difference. Easy. colorful. I would cut down on the cilantro a bit.